Diamondbacks 8, Dodgers 2. The Dodgers will look to claim their next victory after it clears waivers. Some noteworthy headshots from Spring Training, 2004 by Jon SooHoo at this link. The Dodgers did not end up with their long-rumored starting pitching acquisition. Ryan Dempster has been traded by the Cubs to Texas, leaving the Dodgers with Stephen Fife as their No. 5 starter until Ted Lilly returns from the disabled list, unless they choose a different arm from the minors or acquire a player who can clear MLB waivers. Ned Colletti has a history of making deals in August, including the pickups of Greg Maddux, Jon Garland and Vicente Padilla. 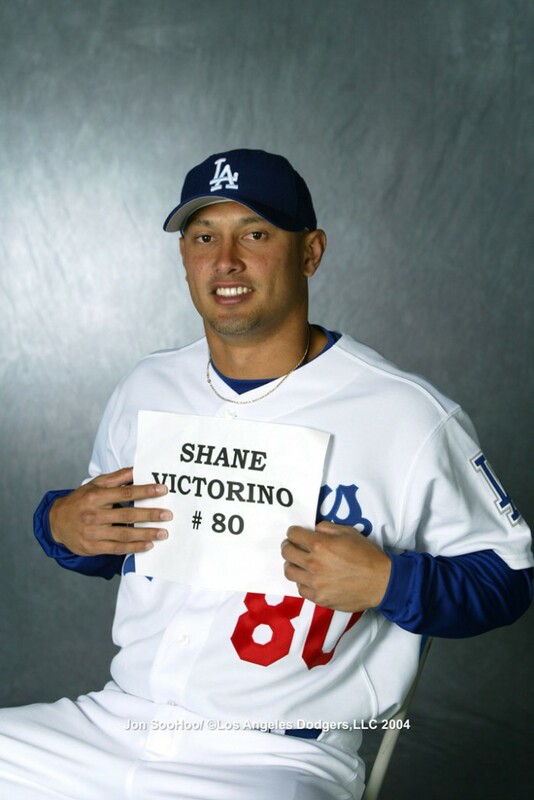 To paraphrase Sally Field, you might not like Shane Victorino. You might really, really not like him. Perhaps because of the 2008 playoffs. (If you can’t get the clip above to work, click here.) Perhaps for another reason. But other than providing Victorino no honeymoon if the Dodgers complete a trade for him, none of that is going to matter. If and when he does well for the Dodgers, you’re going to be happy. If and when he doesn’t, you weren’t going to be happy anyway. As I commented yesterday at Dodger Thoughts, if Sal Maglie, Juan Marichal and Jeff Kent can become Dodgers, it’s hard to say a more insignificant rival like Victorino can’t. Victorino, who was drafted by the Dodgers in 1999 before leaving the organization twice in rule 5 drafts – the second time to the Phillies in 2004 – is having his poorest season in five years, with a .324 on-base percentage and .401 slugging percentage for Philadelphia. The situation is parallel to the Dodgers’ acquisition of Hanley Ramirez – even if Victorino continues at that sub-par level, his total package still is a step up from what the Dodgers have been getting out of their current left fielders, unless you’re a big fan of the outfield defense of Jerry Hairston Jr., Elian Herrera and Bobby Abreu. With his speed (24 steals in 28 attempts) and defense, consider Victorino as Tony Gwynn Jr. with a better bat. The upside for a player like Victorino, who OPSed .847 in 2011 and was at times considered a Most Valuable Player candidate, is gravy. The problem is that Victorino, despite being a switch-hitter, has a huge platoon disadvantage against right-handed pitching, as Jack Moore notes at Fangraphs. His OPS vs. righties this year is .649, and he has never broken .800 while batting left-handed. Again, the Dodgers have seen worse, but given how much more often there’s a right-handed pitcher on the mound, Victorino likely gives the Dodgers a new offensive weapon in fewer than half their remaining games. He’s more a replacement for Juan Rivera (and Gwynn) than for James Loney. Victorino is earning $9.5 million this season and can become a free agent this fall. The reported cost will be Dodger reliever Josh Lindblom and a prospect. Lindblom, though slumping lately, has been one of the Dodgers’ top relievers this year, and he’s someone I like coming out of the bullpen, though that’s an area that’s easier to solve than the outfield. In general, the Dodgers are moving to solve their tremendous organizational imbalance of pitching vs. position players, and so this move would have that going for it. How much of a difference Victorino might make as a Dodger, I don’t know. I can certainly think of players I’d rather have. But like him or not, if the Dodgers get him, it’ll be time to root for him. Update: Tim Brown of Yahoo! Sports reports that the deal is done, with Victorino coming to Los Angeles in exchange for Lindblom and Ethan Martin, the 2008 first-round draft pick who misses bats but has long had control issues. Martin has allowed 89 hits and 61 walks in 118 innings for Double-A Chattanooga this year, but with 112 strikeouts. Update 2: Dave Cameron of Fangraphs likes the trade a bit for the Dodgers. Update 3: The Giants have countered. Hunter Pence, who has a .784 OPS for the Phillies this year, is headed to San Francisco. Update 5: More on the trade from Jonah Keri of Grantland, Cliff Corcoran of SI.com and Carson Cistulli of Fangraphs. Update 6: The Dodgers have designated LHP Michael Antonini for assignment to clear a spot on the 40-man roster. Update 7: The Baseball Prospectus take on the trade. Aaron Harang had a 2.60 ERA in 11 starts since May 28, but he went down hard tonight, surrendering a three-run first-inning home run to Paul Goldschmidt and a fifth-inning grand slam to Chris Johnson in the Dodgers’ 7-2 loss to Arizona. The result allowed the Diamondbacks to creep within 3 1/2 games of Los Angeles and within four of San Francisco, which was in extra innings against the New York Mets as of this writing. However, while dropping a game in the National League sweepstakes, the Dodgers picked up a win for those who cared about the Brandon League sweepstakes. Announced officially shortly after 10:30 p.m., Los Angeles acquired the Seattle Mariners righty reliever for minor-leaguers Leon Landry and Logan Bawcom. League, 29, has a 3.69 career ERA and 3.63 ERA in 2012. After striking out as many as 9.2 batters per nine innings in 2009, League is down to 5.4 this season, while allowing 67 baserunners in 44 2/3 innings. He made a name for himself by saving 37 games in 2011, but that’s already a bit of ancient history. So while the Dodgers might have a little anxiety about how reliable Ronald Belisario, Javy Guerra, Josh Lindblom, Shawn Tolleson or even a recovering Matt Guerrier might be down the stretch (or about replacing any of them if they are traded), League offers another option – but not exactly offer a guaranteed solution. The price was 2010 third-round pick Landry, a 22-year-old outfielder with a .358 on-base percentage and .559 slugging (including 26 doubles and 15 triples) in the happy-hitting California League, and Bawcom, a 23-year-old righty picked in the 17th round the same year, who has a 2.60 ERA and 9.3 strikeouts per nine innings for Double-A Chattanooga. I’m not sure either prospect wasn’t expendable in a pennant drive or expected to be a significant contributor to the Dodgers in the future, and you never know when a guy is going to have a two-month hot streak like George Sherrill in 2009, so the question I would have is less about who won tonight’s deal and more about whether Landry or Bawcom might have had a role in a potentially bigger deal for the Dodgers Tuesday or down the road. 1) Have Kansas City trade Jonathan Broxton to San Francisco. 2) Have Broxton enter the final game of the regular season for the Giants in Los Angeles on Oct. 3, going for a save with a playoff berth on the line. A perfect lineup, as I call it, is when a team only uses nine players from the start of the game to finish to deliver a victory. A new biography of Jim Murray, Last King of the Sports Page, gets a tremendous review by John Schulian at the Wall Street Journal. Reggie Smith, the subject of my piece in The Hall of Nearly Great, gave an Old School interview to the New School’s Fangraphs and David Laurila. Former Dodger general manager Dan Evans provides Baseball Prospectus with an insider’s view of the trading deadline. John Sickels of Minor League Ball gives a midseason update on his top 20 Dodger prospects list. None of the nine Colorado Rockies in the field during the fifth inning of their game Sunday realized they had recorded the inning’s third out, writes Mark Townsend of Big League Stew. The Dodgers’ happy Sunday extended down to the minor leagues, where Jerry Sands hit two grand slams in the first four innings for Albuquerque in the second game of a doubleheader. In addition, Ted Lilly and Rubby De La Rosa each had successful rehabilitation outings, taking steps toward rejoining the active roster sometime in August. The pair combined for five shutout innings with four strikeouts. Yes, I had my guard up. No, I wasn’t ready for this. For the first time since the teams moved to the West Coast 54 years ago, the Dodgers shut out the Giants in consecutive games in San Francisco. Clayton Kershaw picked up where Chad Billingsley and Javy Guerra left off, surviving some hard-hit balls – including one off his glove wrist – to pitch a five-hitter with one walk and seven strikeouts for his fifth career solo blanking, defeating the Giants, 4-0. San Francisco’s three-game shutout sweep of the Dodgers this season has been avenged. The Dodgers had 16 baserunners, not counting the dropped pop-up by James Loney that hepled them take a 2-0 lead in the fourth inning. The second run was driven home by the redoubtable Luis Cruz, who extended his hitting streak to 12 games (and finally pushed his on-base percentage over .300 in the process). Cruz, who went 2 for 4, made his second error as a Dodger as well, but like Elian Herrera before him, has generally done everything the Dodgers could have hoped from such an unheralded contributor. Mark Ellis, Matt Kemp, Andre Ethier and Loney each had two hits, while A.J. Ellis became the first Dodger since Duke Snider in 1955 to have his second four-walk game in one season. Oh – and I almost forgot to tell you – the Dodgers are almost in first place. With 59 games to go – nine against San Francisco – they trail the Giants by .001 in the National League West. Just shy of the anniversary of his August 9 Tommy John surgery, Dodger righty Rubby De La Rosa is scheduled to pitch his first rehabilitation outing today for Class A Rancho Cucamonga – along with lefty Ted Lilly, reports Ken Gurnick of MLB.com. De La Rosa would be a candidate to pitch out of the bulllpen sometime in the season’s final two months, before re-emerging as a starting rotation candidate in 2013. The 23-year-old last appeared in a game July 31. Buck said that in his nine years of catching he’s encountered only one other pitcher who, when going over the scouting reports for opposing hitters, seemed to know exactly what he was doing. 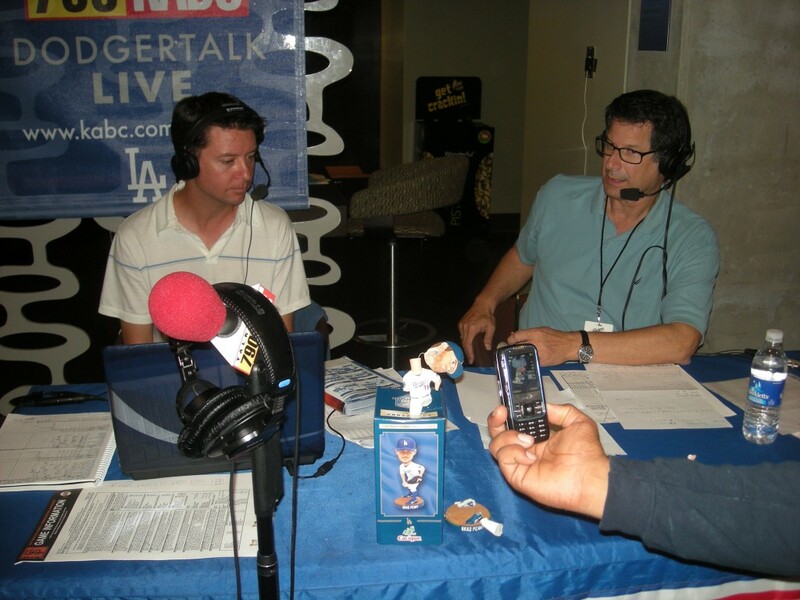 Ernest Reyes of Blue Heaven has a couple of fun posts, including a link to Tommy Lasorda telling Jeremy Rosenberg of KCET about his move to Los Angeles and another featuring an interview with oldest living Dodger Mike Sandlock. The injury bug might have finally reached Rafael Furcal in St. Louis. Furcal, who was on pace to play in 154 games this season, has back discomfort, reports Joe Strauss of the St. Louis Post-Dispatch. In the wake of the Seattle Mariners trading Ichiro to the New York Yankees, Larry Granillo offers historical details at Baseball Prospectus of the San Francisco Giants sending WIllie Mays to the New York Mets. 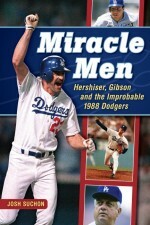 Apparently, if you were a DodgerTalk radio host in 2010, you have to be an author in 2012. Ken Levine and Josh Suchon are both treating us with books. The Me Generation… By Me (Growing Up in the ’60s), by Levine, is already out, and should be of interest to anyone who has a connection to Southern California and/or likes to be amused. It’s more of the great work that Levine, who has a long list of comedy writing and directing credits including “Cheers,” offers on a regular basis at his blog, By Ken Levine. If that’s a natural fit for readers of this site, Suchon’s book needs even less explanation. 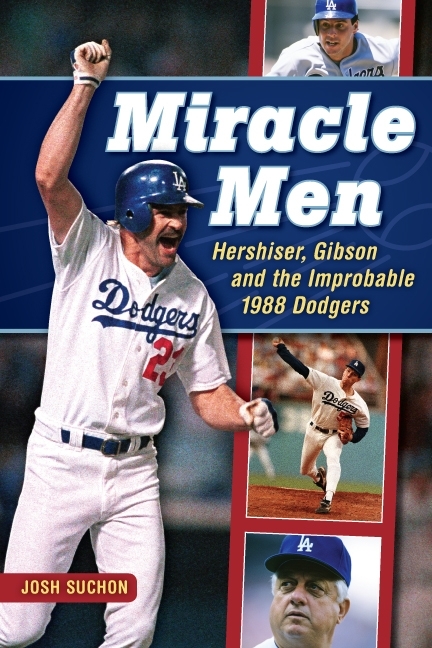 Miracle Men: Gibson, Hershiser and the Improbable 1988 Dodgers will publish next spring, in connection with the 25th or first anniversary of the Dodgers’ last World Series title. Suchon, who wrote a much talked-about first-person piece about his encounter as a teenager with Orel Hershiser following the ’88 Series, plans to interview everyone remotely connected with that memorable year. Congrats to both Levine and Suchon, and happy reading. In a glorious day for the Dodgers, Matt Kemp came a base short of the cycle, doubling in his final at-bat after hitting a two-run home run in the first inning off Barry Zito, singling in the sixth and doubling in the seventh. He scored three times and drove home four. A.J. Ellis, who also homered, joined Mark Ellis, Hanley Ramirez (three RBI), Jerry Hairston Jr. and Luis Cruz in reaching base twice for Los Angeles, which put the game away with a three-run seventh inning for a 7-0 lead. Each of the above players except for Mark Elllis doubled. Javy Guerra got Ryan Theriot to ground out with the bases loaded to end the eighth inning and pitched a perfect ninth to preserve the shutout. The oddity of Chad Billinglsey’s 2012 season, prior to going on the disabled list in early July, was that the best K/9 rate of his career – 2.9 strikeouts for every walk – had not translated into any improvement in his overall performance. His 2012 ERA, standard as well as adjusted for park effects, was almost identical to his 2011 mark. Billingsley was throwing more strikes and throwing fewer balls, but it wasn’t making any difference. Just to take a quick and dirty stat such as quality starts: In 2011, Billingsley had quality starts in 15 of 32 outings (47 percent), while in 2012, before the DL trip, it was eight out of 18 (44 percent). Since coming off the disabled list, Billingsley has made two starts, pitching a combined 13 1/3 innings and allowing only one run on 12 baserunners. In the process, he has struck out only six batters, including two today while pitching 7 1/3 innings of shutout ball, allowing four hits and walking none in the Dodgers’ rousing 10-0 victory over San Francisco. 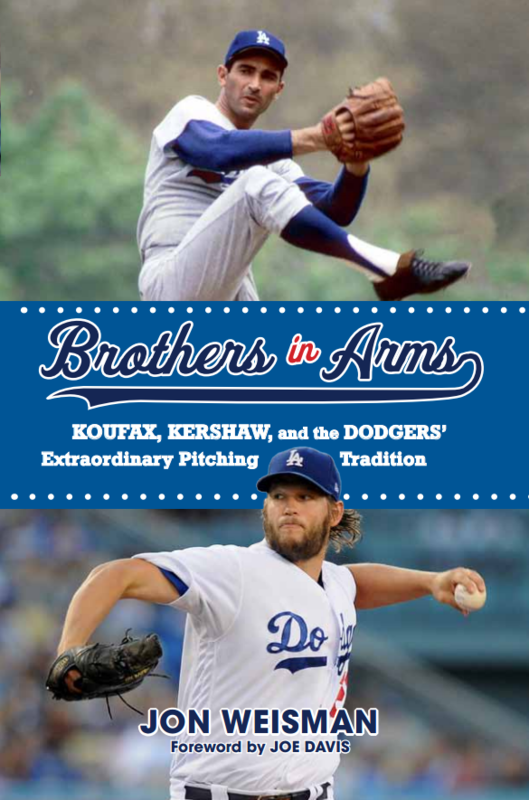 At one point today, I heard Dodger radio commentator Rick Monday – the toughest broadcast critic of Billingsley that I know of – praise the righthander, noting that he finally might be showing the consistency the Dodgers have been waiting for him to do. But there’s nothing new about Billingsley stringing together two quality starts in a row. In 2012 alone, this is the fifth time that he has done so. And he completed the feat today while matching his lowest strikeout total for the season. I know a lot of people don’t like it when luck is discussed in relation to a pitcher’s performance, and I don’t want to suggest that a pitcher has no effect on what happens when a ball is put in play. But I just don’t know how you can escape the notion that circumstance plays a role in what happens with a pitcher. There’s just something counterintuitive to me about Billingsley missing fewer bats but getting better results. Yes, the efficiency is rewarding – Billingsley didn’t cross the 100-pitch mark until he gave up two hits in the eighth inning and took his leave from the game – but it wouldn’t have seemed so efficient if more of those 12 groundouts had eyes. And no, I don’t think Billingsley, Stephen Fife or even Greg Maddux has the ultimate power to decide where a grounder goes – much less to decide when Andre Ethier is going to make a leaping, ankle-testing catch at the right-field wall, as he did today. We’d all like to see a 27-pitch complete game, but baseball doesn’t work that way – not even for the best. One thing I think we can all agree on is that Billingsley can only benefit from attacking the plate. In an interesting post today at True Blue L.A., Eric Stephen noted that National League hitters have an OPS with a three-ball count of .973, and against Billingsley this year, they’re OPSing 1.116. But attacking the plate does not guarantee positive results. Just to repeat – Billingsley has never had better control in his career than he has had in 2012. He has also never had a higher batting average against him on balls in play (.344 going into today). When you put those two factors together, I think it explains a lot about Billingsley’s 2012 season. The temptation for many will be to hope that Billingsley has turned a corner. But it’s much more likely that nothing’s really changed. He’s been throwing strikes for some time now, and if you’re going to argue that the quality of strikes was better today, than why weren’t the Giants swinging and missing? I’m not quite believing that Billingsley has mastered the art of fooling batters just enough but not too much. Billingsley makes mistakes. Maybe he makes more than he should, or maybe he just makes them at just the wrong times. And that’s something that he might have some control over, some ability to improve. But I remain convinced that Billingsley, who lowered his ERA to 3.89 today while winning only his sixth decision in 20 starts, has shown more improvement in 2012 than people – or the baseball gods – have realized. At the same time, today’s game, by itself, doesn’t prove anything. Stephen Fife allowed six of the first nine Giants to reach base and pitched four innings before getting a strikeout. Matt Kemp went 0 for 5. Ronald Belisario blew a two-run lead in the blink of an eighth-inning eye. Kenley Jansen gave up consecutive base hits to start the 10th inning. And still, the Dodgers broke through, ending their 38-inning scoreless streak in San Francisco and pulling out a 5-3, extra-inning victory. Hanley Ramirez, whose bat launches balls like no Dodger infielder we’ve seen since Jeff Kent, hit his second high, sky-splitting drive in four games as a Dodger, this one clearing the left-center wall with Andre Ethier (2 for 4) aboard to break a 3-3 tie in the 10th inning. Ethier had walked on a 3-2 pitch that looked as unconvincingly like ball four as any Dodger walk I’ve seen this year, but so be it. Jansen struck out two batters after allowing the tying runs to reach base in the bottom of the 10th, then got Joaquin Arias to fly to left field. Shawn Tolleson, something of a surprise to pitch the bottom of the ninth with the score tied, retired the side in order and ended up with his first major-league win – a victory that appeared destined for Fife after he not only survived to pitch 6 1/3 innings of one-run ball, allowing nine baserunners while striking out two, but also delivered a fifth-inning double to lead to the Dodgers’ first runs. Los Angeles left eight baserunners during the game, San Francisco nine. 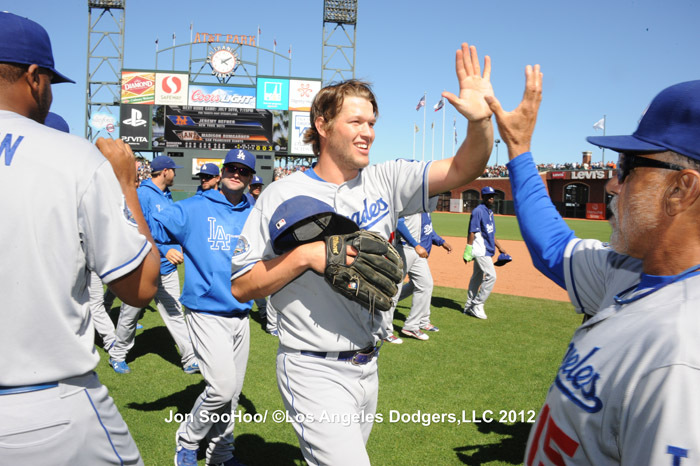 Dodger first basemen James Loney and Juan Rivera combined to go 4 for 5, accounting for a third of the team’s 12 hits.